September 23, 2010 | This article appeared in the October 11, 2010 edition of The Nation. Here's what you see in Waiting for Superman, the new documentary that celebrates the charter school movement while blaming teachers unions for much of what ails American education: working- and middle-class parents desperate to get their charming, healthy, well-behaved children into successful public charter schools. Here's what you don't see: the four out of five charters that are no better, on average, than traditional neighborhood public schools (and are sometimes much worse); charter school teachers, like those at the Green Dot schools in Los Angeles, who are unionized and like it that way; and noncharter neighborhood public schools, like PS 83 in East Harlem and the George Hall Elementary School in Mobile, Alabama, that are nationally recognized for successfully educating poor children. You don't see teen moms, households without an adult English speaker or headed by a drug addict, or any of the millions of children who never have a chance to enter a charter school lottery (or get help with their homework or a nice breakfast) because adults simply aren't engaged in their education. These children, of course, are often the ones who are most difficult to educate, and the ones neighborhood public schools can't turn away. I haven't seen the film yet. Here is a critical review. Davis Guggenheim's 2010 film Waiting for Superman is a slick marketing piece full of half-truths and distortions. The film suggests the problems in education are the fault of teachers and teacher unions alone, and it asserts that the solution to those problems is a greater focus on top-down instruction driven by test scores. It rejects the inconvenient truth that our schools are being starved of funds and other necessary resources, and instead opts for an era of privatization and market-driven school change. Its focus effectively suppresses a more complex and nuanced discussion of what it might actually take to leave no child behind, such as a living wage, a full-employment economy, the de-militarization of our schools, and an education based on the democratic ideal that the fullest development of each is the condition for the full development of all. The film is positioned to become a leading voice in framing the debate on school reform, much like Guggenheim's An Inconvenient Truth did for the discussion of global warming, and that's heartbreaking. I'm not categorically opposed to charter schools; they can and often do allow a group of creative and innovative teachers, parents, and communities to build schools that work for their kids and are free of the deadening bureaucracy of most districts. These schools can be catalysts for even larger changes. But there are really two main opposing positions in the "charter movement" -- it's not really a movement, by the way, but rather a diverse range of different projects. On one side are those who hope to use the charter option to operate effective small schools that are autonomous from districts. On the other side are the corporate powerhouses and the ideological opponents of all things public who see this as a chance to break the teacher's unions and to privatize education. Superman is a shill for the latter. Caring, thoughtful teachers are working hard in both types of schools. But their efforts are being framed and defined, even undermined, by powerful forces that have seized the mantle of "reform." The film dismisses with a side comment the inconvenient truth that our schools are criminally underfunded. Money's not the answer, it glibly declares. Nor does it suggest that students would have better outcomes if their communities had jobs, health care, decent housing, and a living wage. Particularly dishonest is the fact that Guggenheim never mentions the tens of millions of dollars of private money that has poured into the Harlem Children's Zone, the model and superman we are relentlessly instructed to aspire to. Those funds create full family services and a state of the art school. In a sleight of hand, the film magically shifts focus, turning to "bad teaching" as the problem in the poor schools while ignoring these millions of dollars that make people clamor to get into the Promise Academy. As a friend of mine said, "Well, at least now we know what it costs." 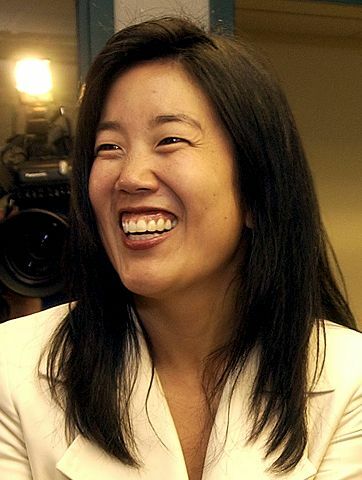 Michele Rhee as the voice of school reform ? Tonight NBC news with Bryan Williams advanced a controversial opinion as fact tonight. Bryan Williams described Michele Rhee as a leading voice of school reform. In fact she is a major voice for one particular view of school reform- the corporate-test driven model. Here is the transcript. The oral statement was even stronger. I encourage you to contact NBC and to protest. Please request a balanced report. The e mail is at the end of the transcript. ;Bryan Williams NBC . Tonight. washington, d.c., voters fired their mayor. while it was just a city mayor's race, that washington election result last night was heard across the country by those who follow education reform. that's because the defeat of mayor fenty means the departure of a big reformer. michelle ree is the chancellor of schools in d.c. this comes just as her profile is about to explode even bigger because of a new film called "waiting for superman." that premieres tonight in washington. our own tom costello is there for us. middle school experiences crucial to success in High School? and here's the New York Times version of the story. At Kathleen Cecil's memorial service on August 30th, several of her students testified to Kathleen's stubborn believe in their abilities in spite of their negative attitudes about themselves upon entering 9th grade. (e.g., "I was determined not to do what she wanted me to do."). Invariably, these students of color implicitly attributed their negative attitude towards teachers and school to their middle school experiences. When I asked a parent of a former middle school student about this, she said, by the time black students get to high school, "they are fed up." 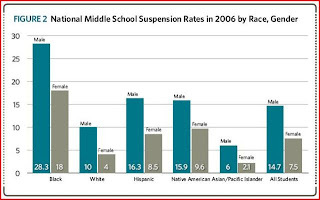 I think the suspension rate is only the tip of the iceberg....we must look deeper. Comcast pulled this ad from its cable channels. It decided. FAIR USE NOTICE: THIS SITE CONTAINS COPYRIGHTED MATERIAL THE USE OF WHICH HAS NOT ALWAYS BEEN SPECIFICALLY AUTHORIZED BY THE COPYRIGHT OWNER. WE ARE MAKING SUCH MATERIAL AVAILABLE IN OUR EFFORTS TO ADVANCE UNDERSTANDING OF ENVIRONMENTAL, POLITICAL, HUMAN RIGHTS, ECONOMIC, DEMOCRACY, SCIENTIFIC, AND SOCIAL JUSTICE ISSUES, ETC. WE BELIEVE THIS CONSTITUTES A 'FAIR USE' OF ANY SUCH COPYRIGHTED MATERIAL AS PROVIDED FOR IN SECTION 107 OF THE US COPYRIGHT LAW. IN ACCORDANCE WITH TITLE 17 U.S.C. SECTION 107, THE MATERIAL ON THIS SITE IS DISTRIBUTED WITHOUT PROFIT TO THOSE WHO HAVE EXPRESSED A PRIOR INTEREST IN RECEIVING THE INCLUDED INFORMATION FOR RESEARCH AND EDUCATIONAL PURPOSES. FOR MORE INFORMATION GO TO: HTTP://WWW.LAW.CORNELL.EDU/USCODE/17/107.SHTML. IF YOU WISH TO USE COPYRIGHTED MATERIAL FROM THIS SITE FOR PURPOSES OF YOUR OWN THAT GO BEYOND 'FAIR USE,' YOU MUST OBTAIN PERMISSION FROM THE COPYRIGHT OWNER. There are schools that work well, and schools that work poorly. The schools that work well almost always are in middle class neighborhoods, and the schools that work poorly are in poor neighborhoods. When these students are brought together in comprehensive high schools- the lower class kids do poorly and the middle class kids do well.